The light-gun genre lives on in the motion controller. Wii has seen an abundance of good to awful entries from these games ever since Nintendo gave us the Wii Zapper, and now that the Move is here we’re bound to see a bunch more for PS3. Time Crisis: Razing Storm is trying to stay ahead of the pack though, not only by coming early on in the Move’s life but also by offering three games on one disc. It’s not even strictly light-gun; the game offers a mode that lets you walk around free as a bird (or human, at least). It’s an interesting pack that offers a mix of ways to play, meaning you should find something to enjoy inside. Razing Storm is – obviously – the meat of the disc; it’s the latest Crisis title to come over to console and features a host of new modes. For your classic Time Crisis experience you’re going to want to hit up the arcade mode, which offers a strictly on-rails campaign from the coin-op machine. It’s a solid campaign that’s suffered a little in its transition from arcade to console. If you run out of lives you can just press the T button and jump straight back into the action, removing any form of challenge other than competing for high scores. That means you’ll also see the entire thing through in about half an hour. My biggest problem is that the implemented Move technology just isn’t as fun as using the game with G-con is. It hurts this mode the most because instead of quickly lining up a shot, you’re simply holding the controller by your side and dragging a reticule across the screen to aim. It really shatters the illusion of the game, but then again Razing Storm supports G-Con 3, so you can easily remedy this if you want to go for the true Crisis experience. Still, you’ll have fun here if you bring a friend along for the ride. It’s not the most challenging or compelling of light-gun games but it’s always better with a buddy. Two can play through arcade in co-op just like the old days, and while it won’t last long you’ll have a good time doing it. That’s not all Razing Storm has to offer though; there’s a story and online mode thrown into the mix too. And get this; you’ll be able to take control of your characters movement in these games. These sections are the weakest part of the package though, offering stiff controls, boring levels and laughable presentation. 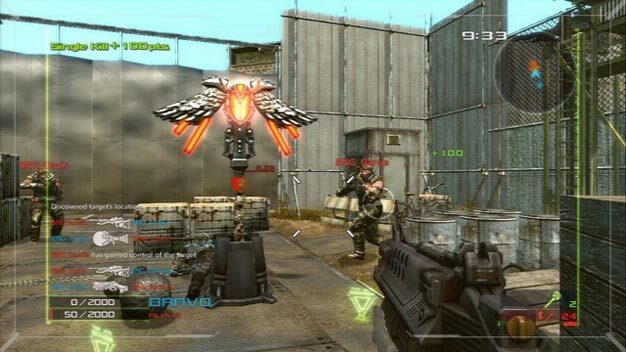 In the story mode you become part of an elite combat unit and navigate a variety of areas from slums to enemy bases. There’s about four hours worth of levels to blast your way through, but given that the actual arcade mode is so much better I doubt many will see it through to the end, especially given the bland graphics that do little to wow the player. Controlling your character is awkward and messy; moving the camera is sluggish and holding the controller up to take cover usually throws your aiming off. It’s a long way off from the Wii’s best FPSs and not worth putting yourself through. Levels don’t offer much variety and weapons are pretty boring and underwhelming; there’s just not much point to it. Take these problems over to the online mode and you’re left with something that you won’t want to touch after your first match. That’s a bit of a shame as it puts the dev’s character customisation system to waste, not that it was anything new. There are a handful of game types and a similar number of players online when you go to check it out; just pretend like it’s not there. Still, don’t be put off just yet. As I said earlier, arcade mode is easily the best part of the game and there’s plenty more where that came from. On top of Razing Storm this disc includes Time Crisis 4 and Deadstorm Pirates, a family-friendly Japanese game. Both of these games throw in more arcade goodness, providing satisfying, if simple campaigns. 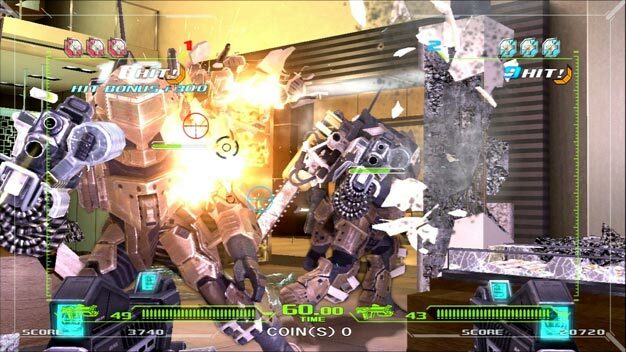 You may remember Time Crisis 4 already released on PS3 but now comes with Move support. It’s fun to go back over it but there’s one mind numbing flaw at work here; the co-op is split-screen. It’s one of the more baffling things I’ve stumbled upon in my gaming career. Surely the game can handle a single screen adventure seeing as both Razing Storm and Deadstorm Pirates do? Speaking of Deadstorm, put this down as the best part of the disc. Razing Storm is fun, but little there is new whereas this shooter offers a comical story, colorful graphics and some minigames to mix things up. You’ll travel downstream doing battle with giant crabs and dealing massive damage. At times you’ll have to wave the controller around to steer the boat, dodging rocks as you go. These parts take a little more coordination if you play co-op, eliminating the feeling of pointless waggling. At the very least it’s something different, and a good bit of fun, if pretty simple. And that pretty much goes for the bulk of this package. Bar Razing Storm‘s poor FPS sections this is a pleasing set of shoot-em ups that should provide a weekend or so of entertainment. It’s not the next level of light-gun games but then again I don’t think such a thing will ever happen so we’d better make do.